I think everyone, everywhere has a mad case of spring fever! So let’s indulge and dream shall we of warmer days to come! 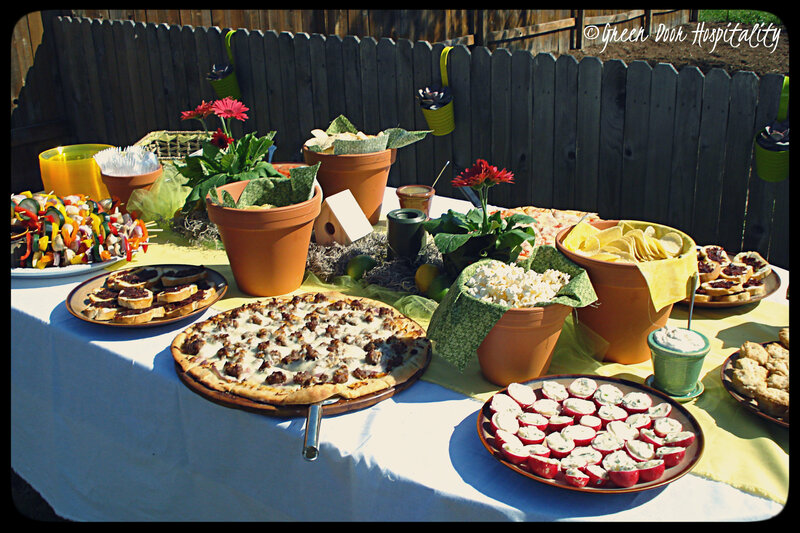 One of my many favorite things about spring is the chance to throw a garden party! It’s a chance to have a gathering of friends over with food and drink to share, as well as some rousing games of bocce ball, croquet, and horseshoes. Taking advantage of being outside and having several activities for your guests is a great way to keep them entertained and the party moving. Garden parties are also wonderful for having a mix of adults and children. Everyone can join in on some fun! I lined the tables with muslin and used a slightly denser fabric in a pale lemon yellow as the runner. The food and beverage tables were then topped with with a light green tulle and Spanish moss. 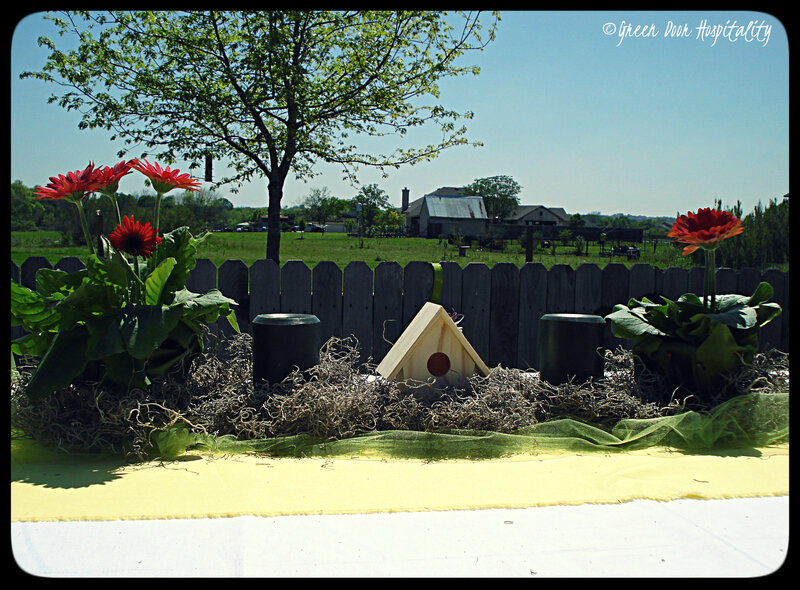 Red Gerbera Daisies, hunter green candle pillars, and a small wooden birdhouse rounded off the effect. I purchased the daisies from the grocery store garden center and left them in their original plastic pots. Instead of putting them in nicer containers, I wrapped the plastic pots with green fabric and pinned it together to complete the look. 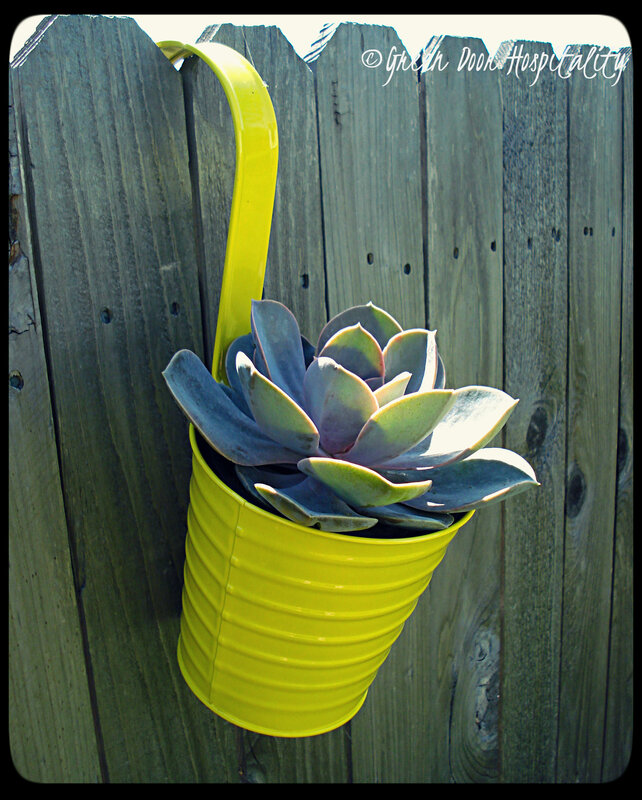 We also found beautiful, inexpensive, succulents and used those to fill brightly painted containers that hung over the vegetable garden fence. A variety of foods is always the key to a successful party! About half of our guests were vegetarian so we stuck with a predominately all vegetarian/vegan menu. Not only was the food healthy and fitting for a celebration of spring and growth, but the dishes were very budget friendly as well! We did Grilled Vegetable Kabobs and Homemade Pizzas for the main entrées. For snacks of chips, popcorn, and sunflower seeds, we utilized clay pots that I lined with fabric remnants. They worked beautifully on the table and gave a great visual element. Plus, the pots can be used for future plantings! Glad I could help with some inspiration! And YES…let’s be DONE WITH SNOW AND COLD!! Goodness! Thanks so much for sharing this on your facebook Valentina!! I can’t wait for spring, planting flowers and herbs and maybe some tomatoes. You provided the light at the end of the tunnel. What a wonderful way to celebrate warmer days! Love everything, the succulent on the fence is too adorable, and the clay pots full of snacks, all so cute and brilliant! I love your menu, what a smart way to keep everyone happy and I bet no one missed the meat! Great post Jessica, full of ideas and eye candy! I love this! How creative! I am envious that your weather is so nice and ‘Spring’ like! Bright, colorful, warm, inviting. It doesn’t get any better. 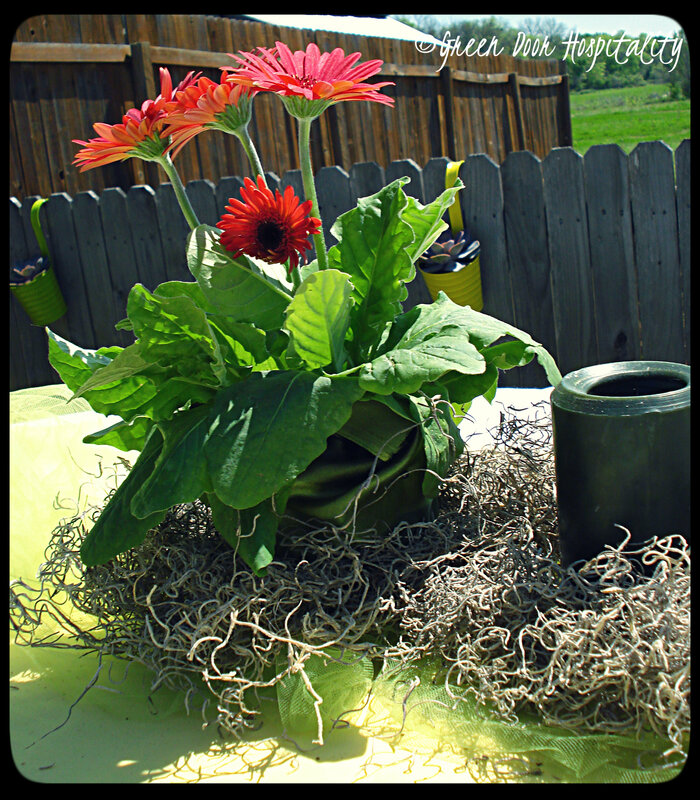 This entry was posted on March 3, 2014 by Jessica Romigh in Entertaining, Party Planning and tagged garden entertaining, garden party, Gerbera Daisies, gerbera daisy, grilled vegetable kabobs, homemade pizza, spring, spring entertaining, spring fever, succulents, this party calls for a theme.